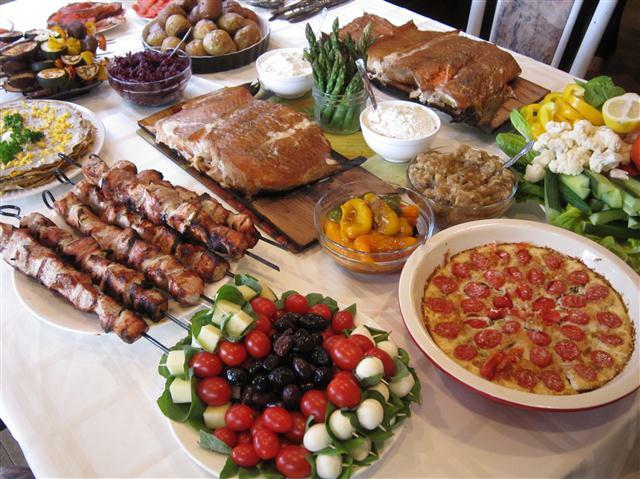 An array of traditional Easter meal dishes from a variety of cultures. Food addresses nutritional and emotional needs and sometimes a food that is not necessarily good for you is just what you need and if you allow yourself to have it, and enjoy it, you can move forward. Deprivation is not the key to healthy eating, satiety is. And satiety is a complex condition. It has both physical and emotional components. Satiety is about sensory satisfaction. It is about the tastes and textures and temperature of what you put in your mouth. Our taste sensations include sweet, sour, salt, bitter and umami. Since my childhood, some have added pungency, coolness, numbness, and a fat sense called oleogustus. Whether we stick to the basic five or expand it to eight or nine, we look for balance in these sensations and each of us has a different need. These needs are determined by our genes – are we hypersensitive to bitter? Does cilantro wake our palate or taste like soap? Can we tolerate hot spices? They are also determined by our social experience. Are there foods that bring us a sense of comfort? it can be mac and cheese or sushi depending on your upbringing. Or marshmallow peeps depending on your childhood experiences. The food industry identified a “bliss point” which is the combination of salt, sweet and fat that keeps us coming back for more, that is designed to override all the components described above. And then there are the foods that we associate with positive and negative emotional experiences, that brought us comfort in the absence of comfort, or that remind us of happy times. The components of a traditional Seder meal. The good news is that for most of us, it is OK to indulge these needs – in moderation. This piece is easier for some of us than it is for others. And it requires eating mindfully. Paying attention to how the food makes you feel – physically and emotionally. The more fragile a place we are in emotionally, the more difficult it can be to modulate our food intake in a healthy way. And the more deeply food was used in our earlier years, the harder it is to not use food in unhealthy ways. So for those of us in this place, we need to embark on a journey to alter the relationship we have with food, to restore food to the place it should occupy in our lives – a source of nourishment, a source of pleasure, but not our only source of pleasure or a dominant source of comfort. As we grow, we can learn to meet our social/emotional needs in other ways, so food and eating can be a source of pleasure rather than yet another source of stress. For the person with celiac disease, gluten can have deadly consequences, so it is necessary to find satisfying foods that are gluten free. For the person with an anaphylactic response to peanuts or any other food, those foods have to be meticulously avoided and satisfactory substitutes found. For the alcoholic, no matter what the memory or desire, consumption of any alcohol is dangerous and it is necessary to find a safe alternative. And there are many other conditions where consuming one food or many desired foods has immediate consequences that make meticulous avoidance necessary. • Toss chicken pieces in a plastic bag with salt and pepper. • Heat olive oil in a large cast iron pan. • Sear the chicken pieces and place in a covered ovenproof casserole. • Clean the cauliflower and break into 2-inch pieces and place on top of the chicken. • Chop the carrots into ½ rounds and add to the casserole. • Peel the garlic cloves and add. • Then add the pearl onions. • Cover all with the chicken stock (it should reach the top of the ingredients). • Place in a 350 oven for at least 1.5 hours; it tolerates longer cooking or being reheated well.